In social situations or in the workplace, visible sweat is a real embarrassment for many people. Learn how to reduce sweat easily! While the $20 Billion a year antiperspirant industry tries to convince you it has the answer, once you understand sweating better, you’ll see there are many possible ways to manage this. Apocrine glands, which produce fatty translucent sweat and are mostly found in the armpits. The more common watery sweat of the eccrine glands. The first is triggered by a combination of core body heat and skin temperature. Acetylcholine is released, and the more of this neurotransmitter that is triggered, the more you will be sweating. The second way comes from a stress “fight or flight” response. This system works with epinephrine (adrenaline). It explains why we’re sweating when nervous or under pressure. Spicy food can also trigger a localized sweating response. In addition to antiperspirants, there are a lot of potential weapons in your armory for managing sweat. The simplest way to combat sweating involves smart clothing choices. Dark colors or white hide sweat the best, while bright colors show it up. Fabrics which allow some airflow or move water away from your body are ideal. Cotton might be light and cool, though it will hold on to sweat. Absorbent pads, wearing a light undershirt with your business attire are also practical solutions. Shaving your armpits is a quick win for those managing their sweating. Women have known this for years, though men are now starting to catch on. Not only does it allow airflow and reduce microbe build up, but shaved armpits also let your antiperspirant get to where it is needed. Food and drink is a contributing factor in how much you’re sweating. Caffeine stimulates the nervous system, and hot beverages also raise your core temperature. Alcohol dilates blood vessels, and many beverages contain a lot of sugar. Processed foods are even worse. The combination of processed sugars, salts and trans-fats gives your body a lot of things to excrete! 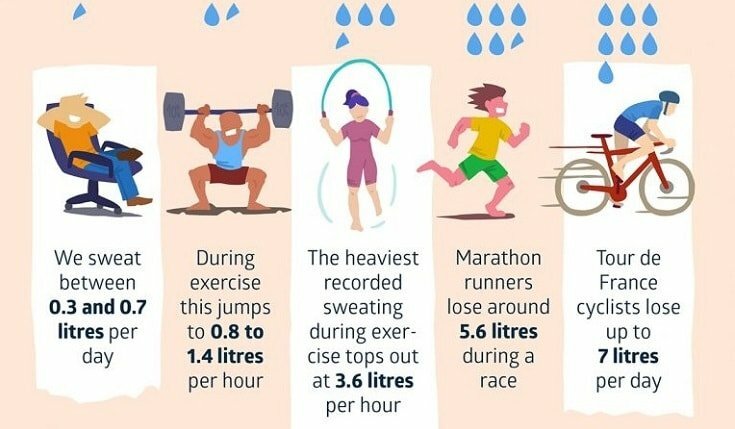 The infographic below explains the nuances of sweating. It also lists practical prevention strategies – and explains the fine line between simply being a heavy sweater, and having a medical issue.